In many older urban neighborhoods, the major problem of long-term disinvestment results in large-scale abandonment and vacancy. 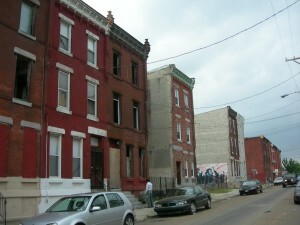 In Philadelphia, and other Northeast post-industrial cities, the rise of obsolete land use and vacancy throughout many of these redevelopment neighborhoods actually dates back to the race riots of the mid-1960s, when these neighborhoods were already experiencing a loss of jobs and an aging housing stock. However, some of these neighborhoods are beginning to see renewed investment, especially those located adjacent to large institutions or expanding Center City neighborhoods. Philadelphia’s neighborhoods inherently offer sustainable lifestyles, and the “Right-Sized” approach is committed to the health and occupation of these potentially vibrant communities, by working with developers and neighborhoods residents for revitalization efforts and neighborhood identity.